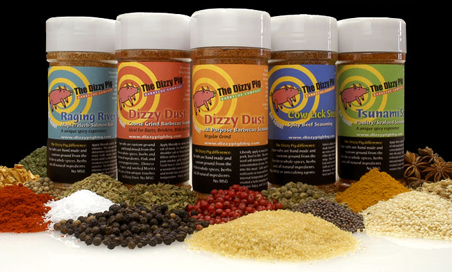 Smoking/Barbecueing/Roasting Cooking at lower temps is what barbecue is all about, and Dizzy Pig® rubs are perfect for this style of cooking, and for oven-roasting. The meat slowly cooks while the rub evolves into a tantalizing crust. Just apply a coating of rub a few minutes to several hours before the meat goes on. Grilling/Broiling All of our rubs (except Cow Lick™ and Raising the Steaks™) contain a little sugar to help build a golden caramelized crust. Yet high temp grilling can burn sugar. So when grilling or broiling with our sugared rubs, avoid extremely high heat and/or cook further from the heat source on a raised grate. High heat can be used for short grilling of thinner meats, but keep a close eye so the sugar does not burn. How much rub? Experiment with different amounts of rub, and settle on the one that gives you the best flavor, crust and optimum saltiness. Remember that thicker meats can take more seasoning, and that longer cooks mellow the flavor of some spices — so more can be applied for these situations. Dizzy Pig® rubs are not too salty, so it takes a lot to oversalt your meal. Freshness and storage Tightly cap your Dizzy Pig® rubs and store in a cool dark place for longest life. Our rubs may cake and clump with time, especially in humid weather conditions or with age. Our rubs are bottled immediately after grinding, when essential oils — the lifeblood of the spices — are released. Using pre-ground spices and chemical anti caking agents would certainly help the blends flow freely from the bottle…but we’ve decided to keep our products natural to assure the freshest flavor. A few gentle taps on the table, and some shaking usually breaks up clumping. For difficult caking revive the rub with a quick pulse in a small food processor or grinder, and return to shaker bottle.